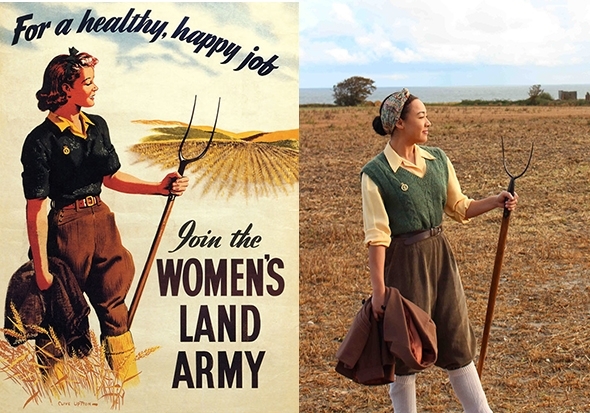 Inspired by Vita Sackville-West’s wartime book, The Women’s Land Army, Cecilia Watts’ WLA No. 657005 is a narrative work that ‘celebrates the significant role of young women working as agricultural labourers during the Second World War.’ As such it will have resonances with an audience who has either some recollection of the WLA or a relationship with someone who did. The specific identity in the title suggests the latter — perhaps a celebration of a family member — for Watts is far too young to remember the WLA herself. She has, however, done her research and found a physical and musical imagery that convincingly conjures up the era. In some of her groupings of the five women (Rosalie Bell, Rachel Elderkin, Zoe Moody, Caitlin Murray and Alice White) there is a sense of the wholesome, patriotic activity depicted in WLA posters, and their frequent peering up at the sky immediately suggests passing aircraft. In her choreography Watts effortlessly weaves dance and muscular gestures from the sowing and planting repertoire (not for her the Lumber Jills of the Women’s Timber Corps) with a strong suggestion of mutual support among the women. Watts also weaves a story into WLA No. 657005: a young hedonistic woman (White) prefers to party than to join the WLA until she receives word of the death of her lover; her friends support her in her mourning and she finally exchanges her polka dot dress for WLA working clothes. There are some hiccups in the narrative and nervousness in some of the performers that limits, especially in such a short work, the full spirit that inhabits it. Pianist Robin Porter, who also wrote and arranged some of the songs, is seated out of sight behind the upright piano as if we are listening to the radio, so when his spirited playing is enhanced by a couple of tracks by The Andrews Sisters the shift is seamless. He makes a brief appearance as the messenger of bad tidings and inexplicably walks off with the sheet music during his final playing of Boogie Woogie Bugle Girl, though it allows White to redeem herself, and to re-find herself, by continuing on the ivories to the end. John Livingston is a fascinating performer for he brings to his dancing a vocabulary of disability that is both eloquent and powerful. With a provocative and savagely self-deprecatory title, Am I a waste of space?, Livingston challenges what we see by what he does, quoting Henry David Thoreau in the program notes, ‘It’s not what you look at that matters, it’s what you see.’ There are three emotionally laden tracks — When I am laid in earth, from Henry Purcell’s Dido & Aeneas, Bjork’s Black Lake, and Anna Calvi’s The Heart of You — to which Livingston improvises with a range of images from refined, heroic sweeps of the arms to raw, idiosyncratic gestures like tucking his chin into his tee-shirt while putting it back on, gestures that both uncover the process of his thinking and enhance its physical execution. His gestural vocabulary repeats enough for us to recognize his language, his tropes, rather than follow a choreographic path but what we see is a concentration on unearthing his own physical meaning from the music. Mesmerizing. What a relief to see Alice Weber freed from the trauma of Pomodoro and displaying a relaxed, sassy double in the opening tryptich of Inter/action. Filmmaker (and erstwhile collaborator) Ben Saffer’s bright, even light and Weber’s off-white costume suggest something heavenly as we see her dancing the same sequences that are projected on the screen behind her. Is she following her filmed self or is the film following her? The breaks in sequence and Weber’s wry gestures soon suggest a bad rehearsal day, but between bouts of inner frustration or self-doubt her dancing has the relaxed flow of someone enjoying herself in eerie serenity. 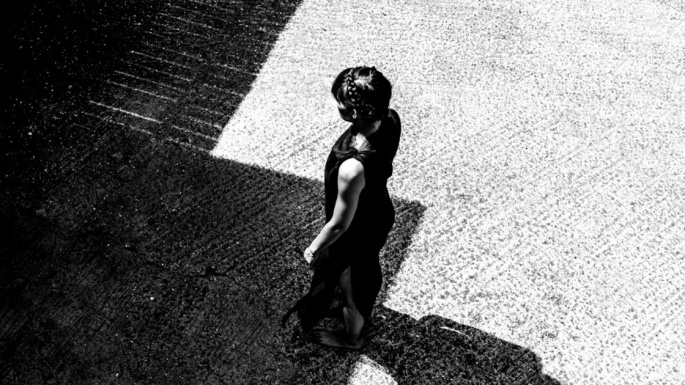 A second section begins with a track of Trent Reznor and Atticus Ross (Pieces Form the Whole), heralding Merritt Millman dressed in black with a facial smirk; the suggestion of Black Swan is inevitable. The duet becomes a tussle, a choreographed rugby scrum with two players, the creative facet of performance locked against the demonic or, as the program note suggests, ‘exploring the different relationships of the body and self in performance space.’ In the third section Weber is again dancing on her own accompanied by Saffer’s Music for Inter/action against his filmed collage of time-lapsed natural phenomena —scudding clouds and the reproductive systems of plants. Becoming one with her filmed environment, Weber evokes a healing presence, and when the flowers begin to close up she yields to their impulse and folds into herself.